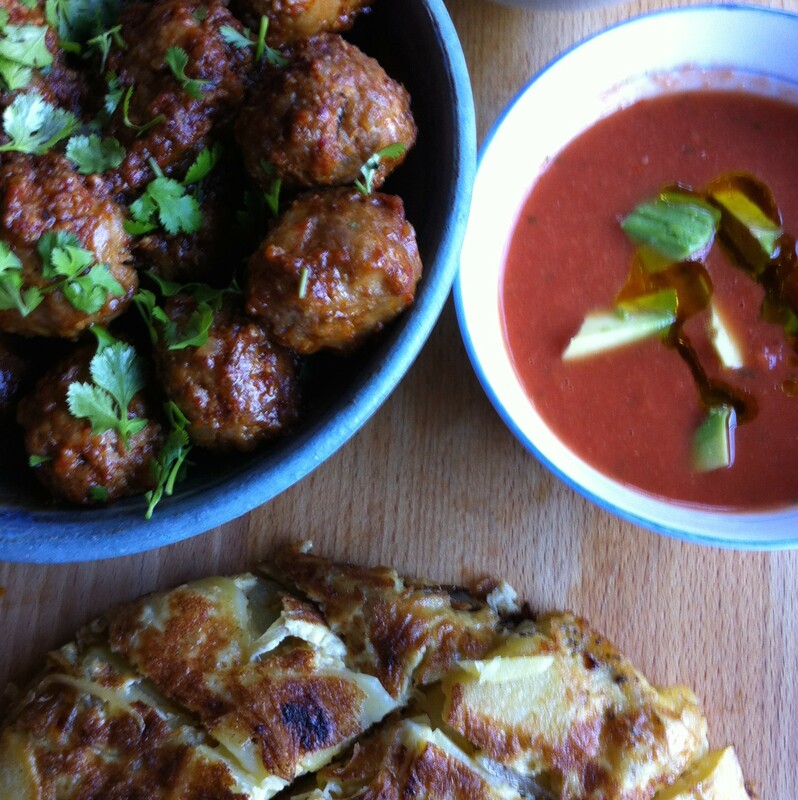 Albondigas, tortilla and gazpacho are on the menu for our Spanish World Cup meal. I don’t remember where I got this albondigas recipe from – I have a vague memory of copying it from a magazine. At any rate, I’ve been making it for years. Combine the pork, egg, garlic, onion, breadcrumbs and spices in a bowl, and mix together with your hands. Form into bite-sized balls – it should make about 20. Heat half an inch of oil in a heavy skillet until hot, but not smoking. Dust the meatballs with flour, and cook, turning regularly, until they are browned on all sides. Remove to a paper-towel lined plate. Wipe out the pan, and add a fresh Tb of olive oil. Sauté the onion over medium heat until softened, then add the garlic and piquillo pepper. Add the chicken stock and simmer for 10 minutes. Purée the sauce in a food processor or blender, then return to the pan. Add the meatballs to the sauce and cook ten minutes, turning regularly, until the sauce has thickened and the meatballs are cooked through.